Foot/Ankle Surgery Recovery – One Fine Day! Today, February 27 is one fine day! Today I am out of a cast, and into a walking boot! Today I have no blood clot, am continuing blood thinner for a couple more weeks then done with that!! WOOOHOOOO!!! I had an ultrasound on February 26 at CVCA. The ultrasound tech, Oleg, advised me afterward that a piece was missing from the clot and things were looking up. I had an appointment with Dr. Ayaaland at CVCA to discuss the clot this morning. He saw me immediately and advised that the clot was gone. Not there anymore. He advised me to continue with my current blood thinner medication until it was gone then just stop. I’m to return in about 3 weeks for a last ultrasound, probably to confirm it didn’t return. From there I went to see my surgeon, Dr. Daniel Cuttica. First the obligatory x-rays. After x-rays Dr. Cuttica examinined my foot, in which the doctor pushed the foot around a bit, stretching movement up & down and right and left, he pronounced that I would not have another cast on, and I could remain in the walking boot that he put me in when I was there last and a blood clot was found. This photo is the x-ray taken February 27th. 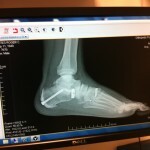 It shows my foot and the hardware inside the foot as well as the growth of my foot around the hardware: . Yes, you are correct, that is a V E R Y L O N G screw in my heel. The hardware which can be seen on the side and top of my foot were called ‘wedges’ by Dr. Cuttica to my wife & daughter following the surgery. It had something to do with reattachment to the tendons which were torn. The screw is in the heel to assist with the arch of the foot, which, pre-surgery, was not there. The foot was flat prior to the surgery. During the surgery, the Achilles tendon was unattached, pulled down, creating the arch, and reattached using that long screw in the heel. The rest of the tendon was cut off, I think. When I first wrote about the surgery in January, I believed that the screw was integrated with the other visible hardware as a triangle on the side of the foot. On reviewing the surgery, as well as today’s x-ray, I realized that there is no triangular hardware; the wedges are separate from the screw and the screw is what I described. The screw & wedges do not touch in the foot. I know this is pretty amazing, but there is no pain now, nor has there been any. As in the last surgery, I follow the doctor’s orders and healing simply happens, without pain, and without much aching as well. Dr. Cuttica advised me to begin putting 25 pounds of weight on my foot today. Then, every other day to put 25 more pounds. So, day of tomorrow, I put 50 pounds of weight on my foot, and etc., etc. until in about a week or so, I’ll have all my weight on the foot while in the walking boot. 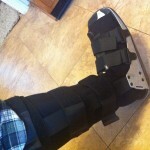 Here is a picture of my walking boot, so you know what I’m in. The boot is tall, and it extends side to side as well to protect the foot. At the bend of the foot, and on the right front is a little air valve. The boot can have air inserted. Air bladders inside the boot, when pumped up, hold the foot in place. This air usually has to be replaced a few times a day. Here’s the boot: . A viewer can’t see, but the boot is firmly on the foot & leg without being tight. When the boot is first placed on the foot, it is completely opened. The foot is set inside the boot. Then the top, over the foot has a foam piece on the right side of the boot that lays on top of the foot. A second piece on the left side folds over top the first piece and a 1″ wide slice of Velcro hooks onto the bottom piece from the top piece holding the foot in. Further fastening is from the two 1 1/2″ wide straps you can see over the top of the foot which fasten over top right to left, then thru a couple of plastic slots on the left side of the boot and the strap is returned back over to fasten on Velcro on the right side of the boot. After covering the foot, the same closure system with the fold over is done to the leg. A long Velcro piece runs the length of the leg foam and the two foam pieces of the leg come together. Last are the three straps which can be seen which fasten over the leg, and back by Velcro. Last, the pump is inserted and air is inserted till the boot is comfortable. Done. Upon my return to home, I got my home scale out and attempted to put 25 pounds of weight on my booted foot. Not to be. 40 was the minimum. This was because of the weight of the boot pushing down on the scale. So I weighed the boot. It’s about 5 pounds. I tried again and finally figured out how to get the weigh in down to about 35 pounds. Actually, that’s the same weight I used in the last week since, with the walking boot, a person on crutches really can’t have zero weight on the boot. The boot is much longer on the bottom than a cast so unless the boot is swung up off the floor and forward of the rest of the body, there is going to be at least some weight on the foot. Swinging the boot forward, with the weight of the foot in it, makes one feel very, unbalanced. The following photos are of my foot as of February 27th. Looks pretty bad to the layman: that’s me. But the surgeon thought it looked great! I thought readers would like a look at the foot after 6 weeks. The first one is of the top & right side of the left foot: . Next photo is the left side and back: . The last photo is of the back of my leg. Notice all the dead skin on the leg. That happened in the cast. I was going to remove it, but the foot and leg were too painful to attend to that. . Overall, it was a fine day!